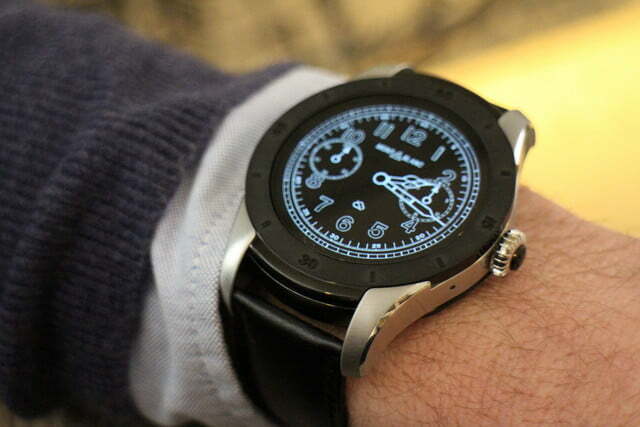 If luxury were measured by size, the $890 Montblanc Summit would be the most luxurious Android Wear smartwatch in the world. 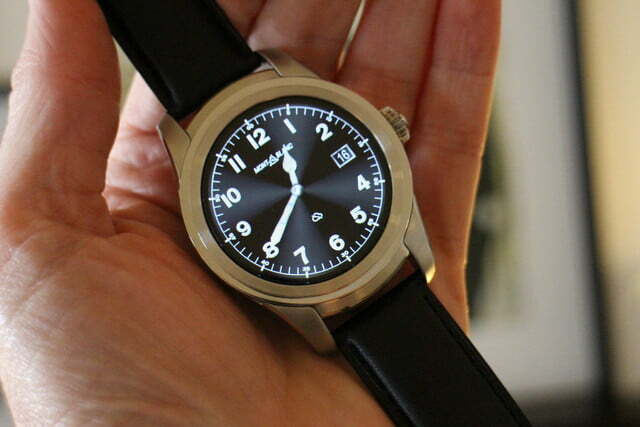 Just when the world seemed to be losing interest in smartwatches, along comes a new luxury option from Montblanc, a German brand best known for its beautiful pens, leather goods, and a range of mechanical watches. 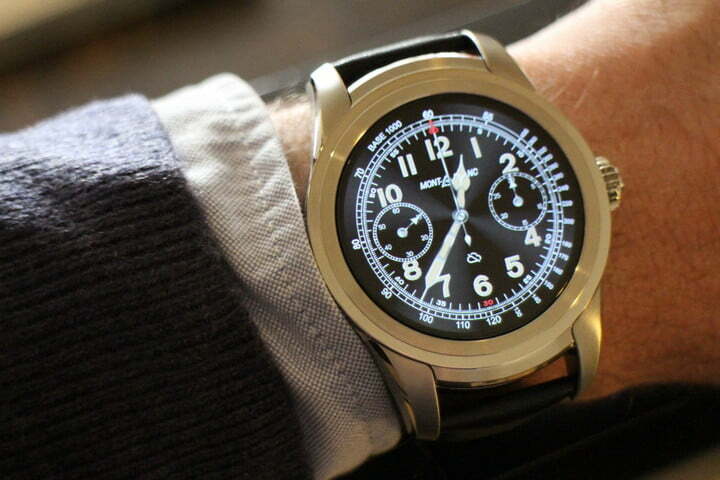 It’s called the Montblanc Summit, and it’s going to cost you at least $890 if you want one on your wrist. That’s a lot of money for a smartwatch, especially when interest among regular people isn’t exactly high, so is it worth a look? A hundred years ago, Montblanc identified a problem faced by many travelers at the time: fountain pens leaked in the pockets of well-to-do folk, so it made a fountain pen that didn’t leak. Since then, it has concentrated on seducing travelers with its products, and the Summit is no exception. 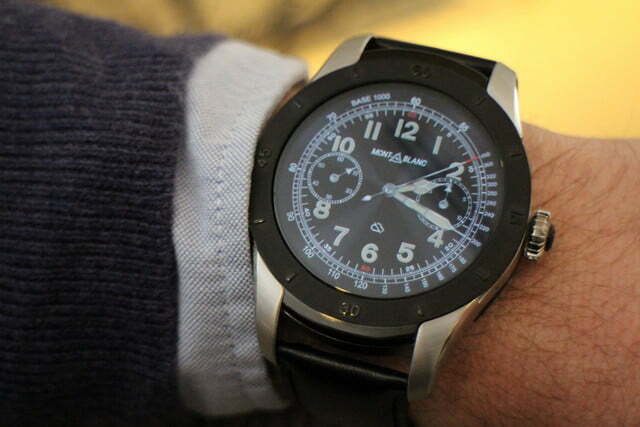 When we say the Montblanc Summit is for people with large wrists, we really mean it. Strapped on the wrist of a jet-setter navigating airports, hotels, and cities, the Summit will be there to deliver notifications, fitness data, and handy travel tips and advice from a selection of partner apps. Google Assistant is onboard for voice control when your hands are full with boarding passes and Mont Blanc weekend bags. It’s an evocative vision, and rest assured when you’re running through the airport lounge, everyone will notice the Summit on your wrist. Because it’s massive. 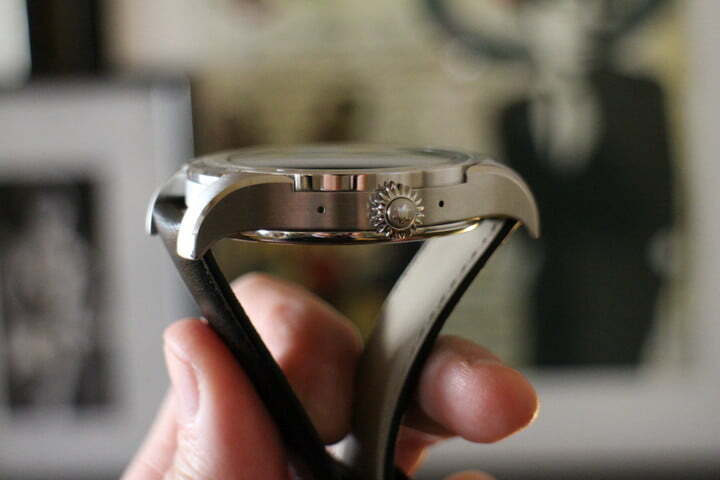 The body measures 46mm, and on my wrist, the lugs extended over each side, so it refused to fit under the cuff of my shirt. 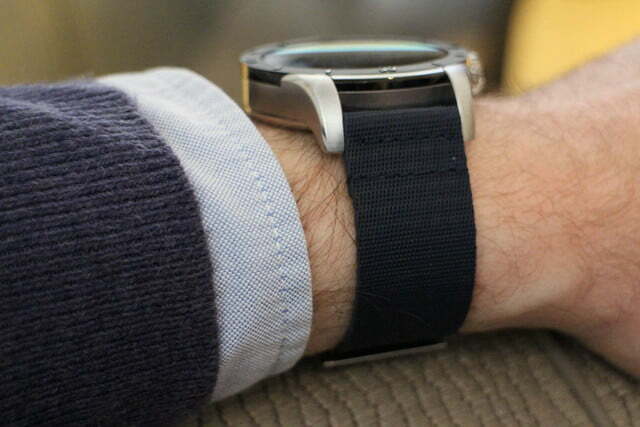 Subtle it’s not, nor is it a watch for those of slender wrist. 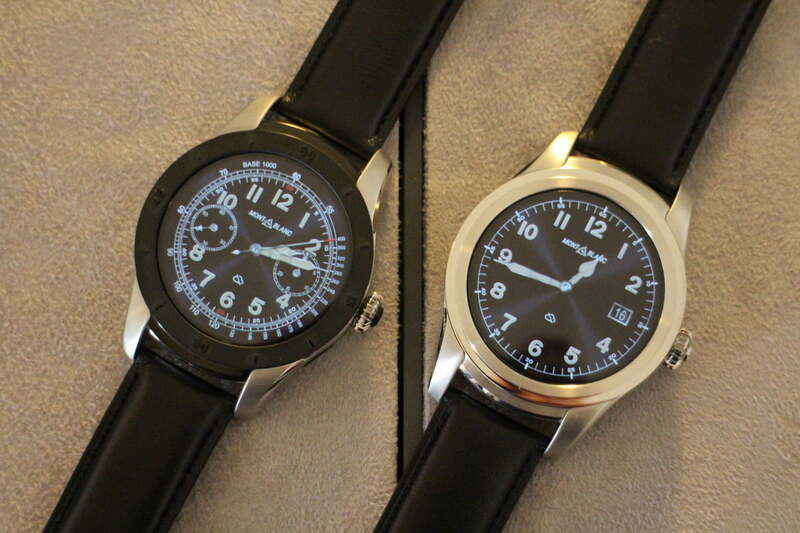 For the Summit, Montblanc has taken inspiration from the design of its 1858 mechanical watch collection. The stainless steel watch comes in either a polished finish, black, a combination of both, or grade 5 titanium. Each has an IP68 water resistant rating. Look closely, and you’ll pick up on the design details taken from the 1858 watches, such as the satinated sides and horns, the polished section of the bezel, and the flashy crown. Pay particular attention to the sapphire glass over the top of the 1.4-inch, 400 x 400 pixel, AMOLED screen, which has a slight dome to it. 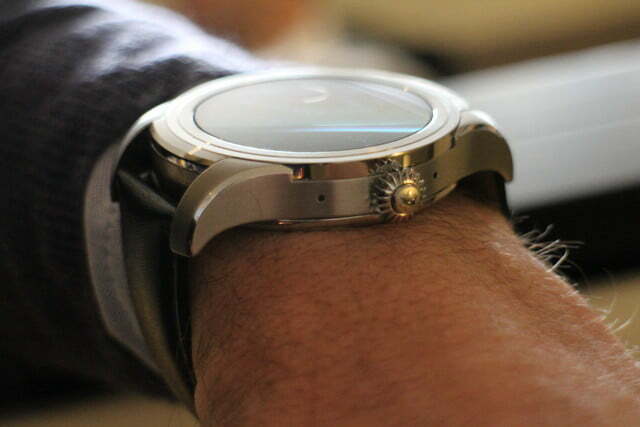 It looks superb, way better than the flat screens seen on most other smartwatches, and is an eye-catching feature that gives the Summit a unique style. It was a challenge to develop, as maintaining touch sensitivity was tough but essential. 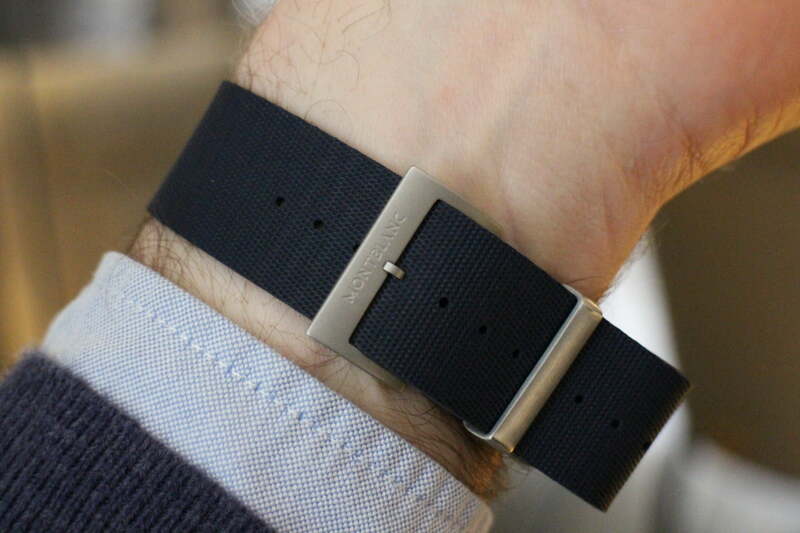 After trying the different models on, it was the combined black and polished stainless steel that appealed most when matched with the black leather strap. 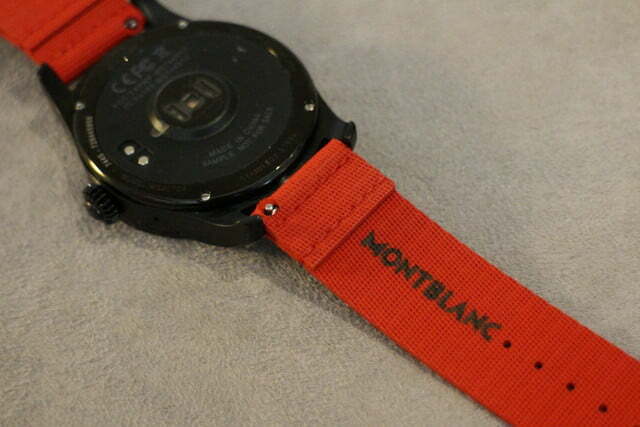 For sporting use, Montblanc has made a special natural rubber strap, which actually looks and feels like soft fabric, but will stay comfortable when sweating it out in the gym. It comes in blue, green, and red, in an extraordinarily long length. We checked to see if it was simply a long version, but it’s not. 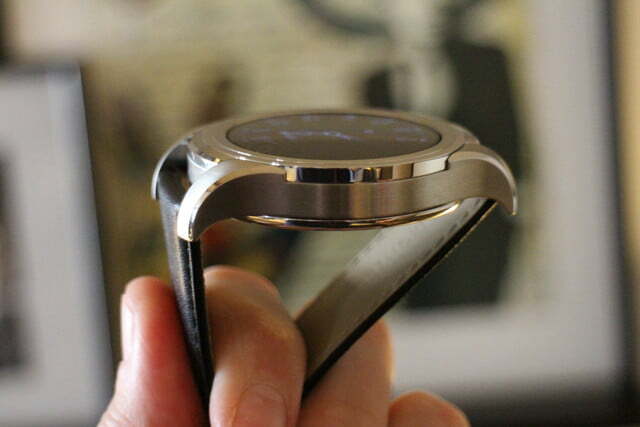 The leather strap was also quite large, and even the tightest hole still saw the watch hang a little loosely. 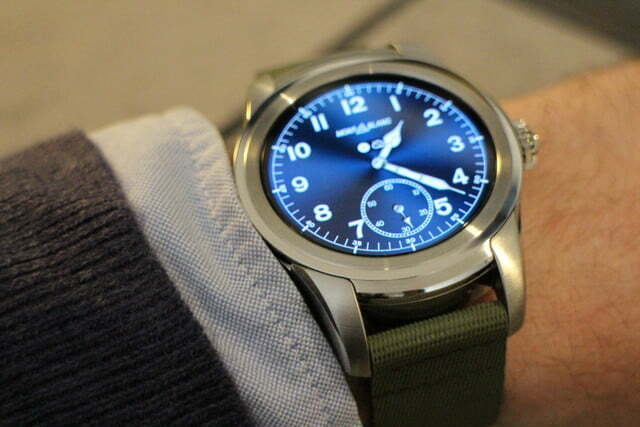 When we say the Montblanc Summit is for people with large wrists, we really mean it. 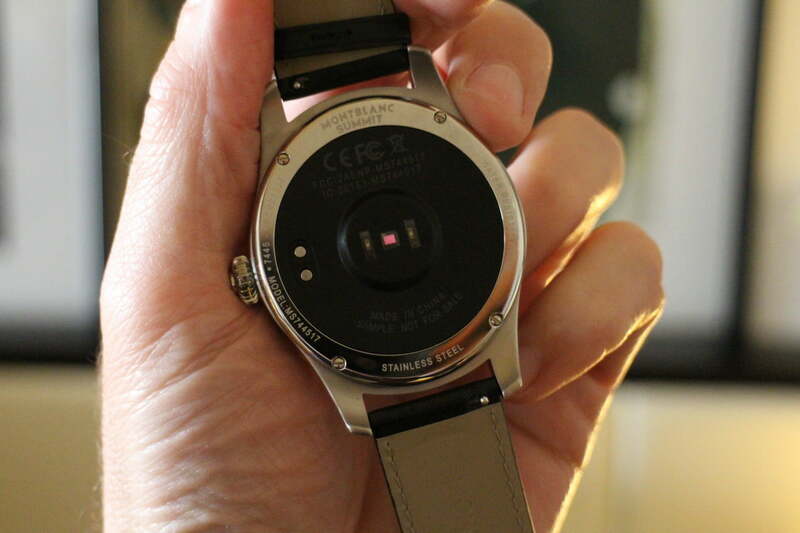 Unlike Tag Heuer’s Carrera Connected watch, which uses an Intel platform, the Summit has a Qualcomm Snapdragon 2100 processor that’s specially engineered for wearable technology. 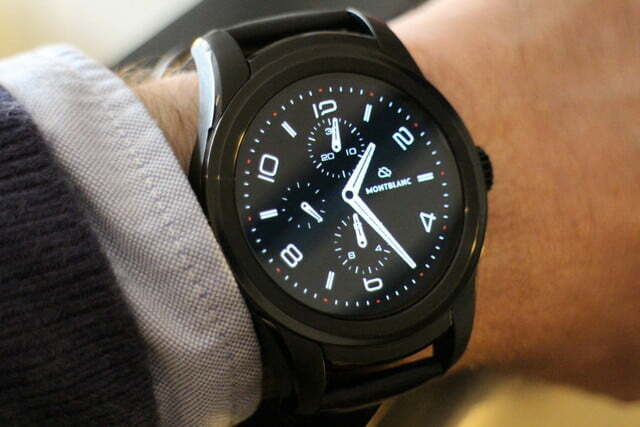 It comes with 512MB of RAM, 4GB of internal storage space, Wi-Fi, Bluetooth, and the usual array of sensors. 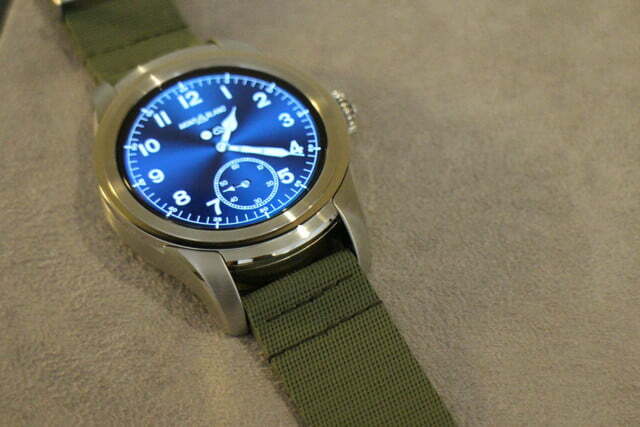 It doesn’t have GPS or the ability to make calls, but there is a microphone for conversing with Google Assistant, which is part of the Android Wear 2.0 operating system. It was smooth and fast in our brief time using it. Underneath the body is a heart rate monitor, which rather than lay flat, sits slightly proud. This is to ensure a better connection with the skin, and therefore a more accurate reading. The 350mAh battery will last a day and is charged on a plastic plinth that’s the least luxurious aspect of the Summit. 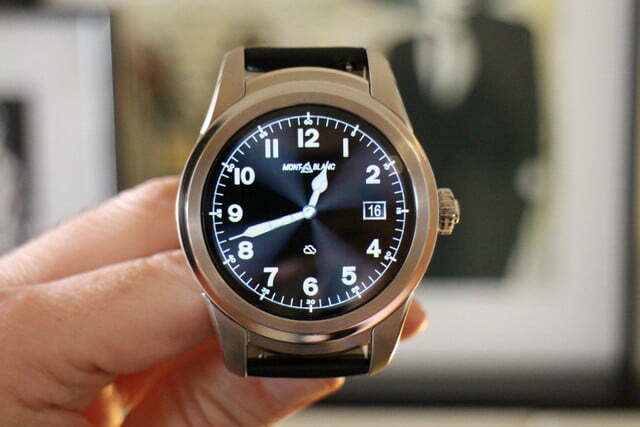 Montblanc has teamed up with Uber, Foursquare, and Runtastic for the Summit, and each has its app pre-installed on the watch. There are various Montblanc watch faces, all modeled after the 1858 collection, with working chronographs, lap timers, clever complications, and some stylistic touches like digital reflective surfaces that glint when you move the watch, to add some glamor. The Montblanc Summit is now available and the basic watch in stainless steel or black with a black leather strap costs $890, or $930 with the natural rubber or brown Italian leather strap. 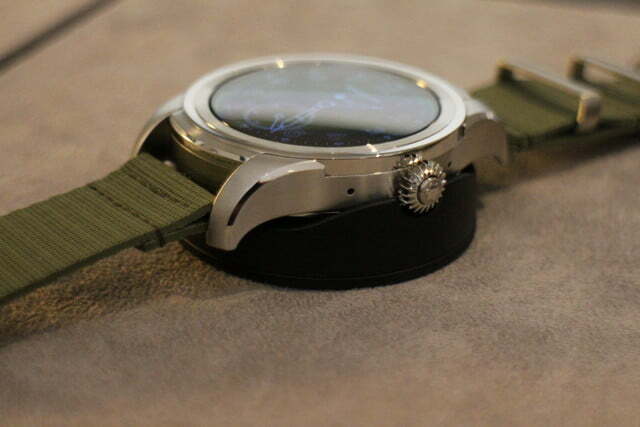 A limited edition alligator leather strap will also be made, and with it, the Summit will cost $980. 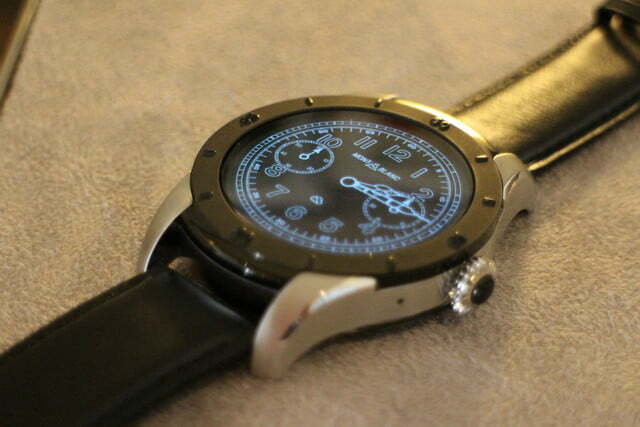 Opt for the grade 5 titanium body, and the prices start at $980 and rise to $1,070 with the alligator leather strap. All the straps can be purchased separately, starting at $100 for the black leather version, up to $250 for the alligator leather strap. For the fabulously wealthy, Montblanc offers a personalization service, where you can design your own dial for the Summit, working directly with the designers. The price for this exclusive service? A mere 15,000 euros, or about $16,100. For the first two weeks of release, which started on May 12, the Montblanc Summit will be exclusively available through online retailer Mr. Porter, after which it will reach Montblanc stores and partners in the U.S. and Europe. 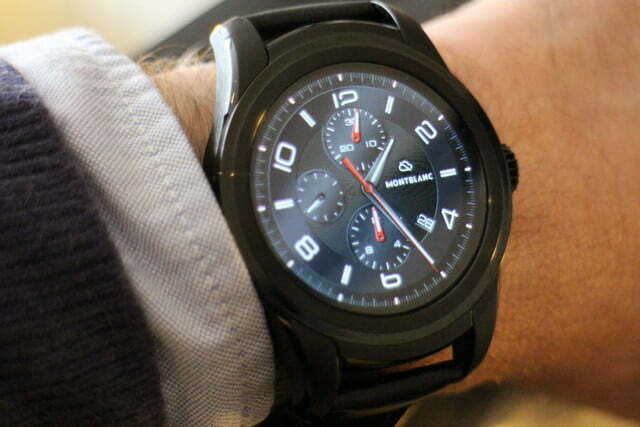 There’s no doubt Montblanc is going all-in with the Summit, completely embracing the smartwatch, and giving its fans a version of which they will be proud. 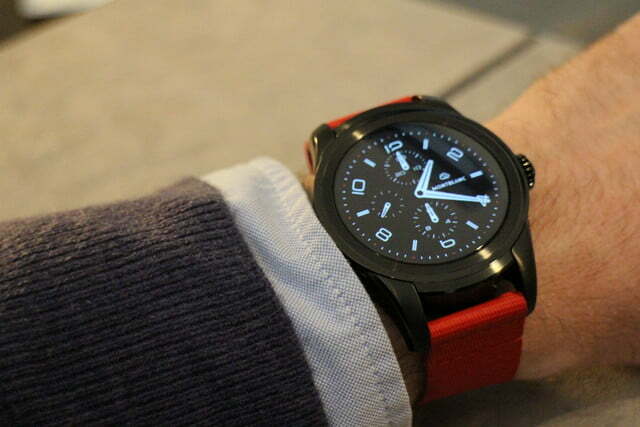 Outside of partnerships with Qualcomm and Google, the company went out and sourced the best components it could find for the Summit, then used Swiss expertise for the design, construction, and unique elements such as the natural rubber strap and domed screen. 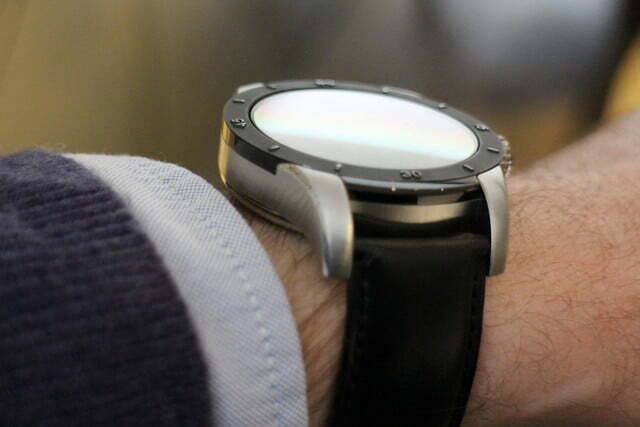 It considers the result the best smartwatch it could make, and one that shouldn’t be seen as a trendy fad, but as a genuine alternative to its mechanical watches, which fits in with the firm’s ethos. 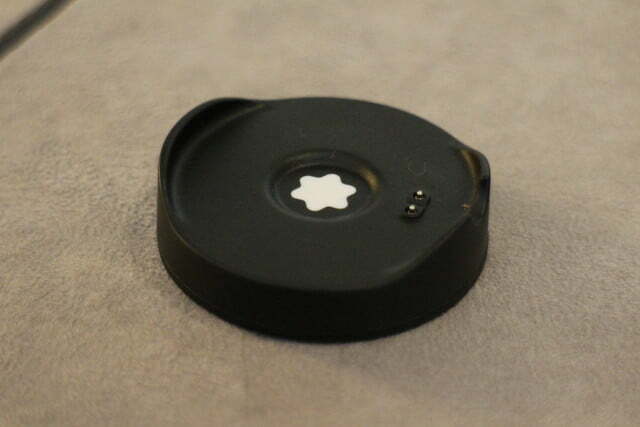 The 350mAh battery will last a day and is charged on a plastic plinth. That’s all fine if you’re a Montblanc devotee with enough disposable cash that spending nearly $900 on a smartwatch doesn’t warrant a second thought. For the rest of us, it’s a considerably more difficult decision. 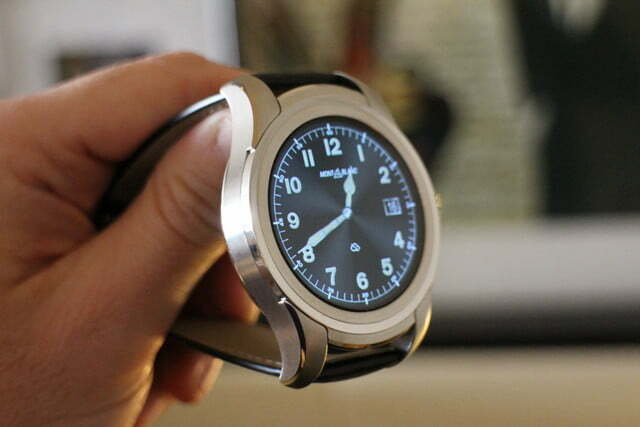 The Summit is technically the same as a $300 Fossil Q Marshal, and technically inferior to the new Huawei Watch 2 that may cost around $400; so if the specs matter to you, it’s unlikely to tick all the boxes. Perhaps this could be forgiven if the Summit was utterly gorgeous, and we couldn’t take our eyes off it for more than a second. Sadly, although we like individual parts of it, the Summit didn’t grab us exactly that way. Sure, we couldn’t stop looking, but the only reason is because, at this size, it’s impossible to miss. Article originally published in March 2017. Updated on 05-12-2017 by Christian de Looper: Added news that Montblanc Summit is available.